A rather large set of new photos that I shot on December 15th are now available for viewing in the RCW Gallery. I think I captured most of the active construction sites in and around Downtown Richmond. If I missed something, drop me a line on Facebook and let me know what I’m missing. Also be sure to check out the Panoramas at the end of the album. The smaller tower crane was added during the past week. 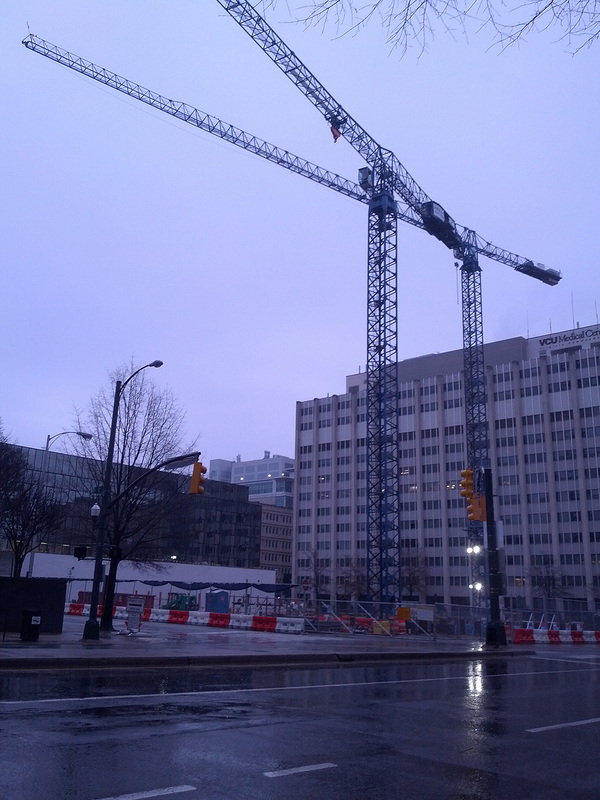 A smaller, but identical tower crane was added over the weekend at the Children’s Hospital construction site on Broad Street. The additional crane should allow the building to rise even faster in the coming weeks and months. I worked most of the day today to clean up the web site account and get the most important parts of this project back online. As you can see, I’ve decided to start fresh with a new front end database for Richmond City Watch (RCW). I’m using WordPress, which I’ve used for the last two years on other projects I’ve set up. It’s incredibly easy to use and even easier to keep updated! I’ve found that I really need to stick with web site software that is easy to use and manage. I want to avoid the web site being taken over by spam bots, again. Check out the navigation bar on the top of the home page to find links to the Gallery and Facebook pages. The current theme (fonts, colors and graphics) will likely change in the coming weeks. I’ll find something a little more architecturally inspiring. Building Database: I plan on restoring these pages as soon as possible. A future update to these pages is planned once they are back online. FAQ/About US Pages: These will be updated and placed back online once I revise the content of these pages. Forums: Will work to restore a functional forum for the web site. I’d also like to archive the old forum at some point.